TAKE That's Howard, Gary and Mark have been enjoying some chill time time on the Bonnie Banks of Loch Lomond in between their hot Scots dates at the SSE Hydro. 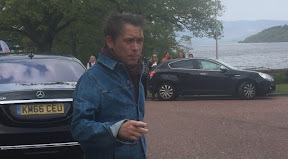 And after seeing a mob of female fans working for them outside their hotel Mark Owen joked that they got a bigger crowd there than at their Hydro gigs. The trio were staying at the swish Cameron House hotel on the outskirts of Glasgow and were welcomed by fifty female fans who had waited to see them since the early hours of the morning. Martins and Bentleys that were from the luxury rally also being held at the hotel. Mark said: "There are more people here than are going to be at the gig tonight." 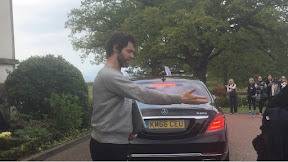 Gary and Howard also waved to fans as they waited on their cars. Howard had to wait so long for his car that he mimed getting into it before it came. The lads played a succession of nights at Glasgow's SSE Hydro and managed to have some chill time this morning with an early walk around the grounds. Excerpts of this article have now appeared in the Evening Times.